Before I get going on this, I'd better clarify something, even though many of my regular readers (and podcast interview listeners) know: my "cowboy" moniker is not earned. It's a nickname I picked up a few years ago, and it shows my cowboy attitude. I don't know nothin' 'bout no hayburners; tell me to saddle up a horse and ride, I'd probably get kicked, fall off, and land in poo. So, I need a guide. Yes, I lived in the West — the west side of Michigan. Anyway, being a cowboy at heart has helped me get things done. My father had a cowboy attitude as well, which is something I learned from testimonials at his funeral. Anyway, adding some Western-style lingo in posts and articles adds color and personality, I reckon, even though I usually have a conversational style for the most part. A while back, I was looking for cowboy Bibles and came across the "Simplified Cowboy Version". It is not pretending to be a translation, but a paraphrase. As they say on their Facebook Page, "The SCV is NOT a bible. It is a Bible paraphrase. Think of it as The Message (for cowboy and cowgirls)." Oh, thanks a heap! The Message is a dreadful paraphrase-commentary, and should be avoided by Christians. but it's just all talk. Y'all don't ride for God. You just make up stuff and say it comes from Him." This makes Jesus look like a dumb hick, and is also insulting to the people they are trying to reach. If you want to give them the Word of God, then do so — without insulting their intelligence. I'm definitely not one of those folks who thinks that the King James Version is the only true Bible and that every Christian should learn how to read its 1769 English. For people who want something accurate but not too difficult, there are many accurate modern Bible translations available, whether full-sized or New Testament shirt-pocket editions. I've been pleasantly surprised by the World English Bible, which is available in many forms, including free versions to download. Many people consider the New American Version to be the most accurate version in English, but is not the easiest to read. Also, the English Standard Version is readable and accurate, as is the older New International Version. 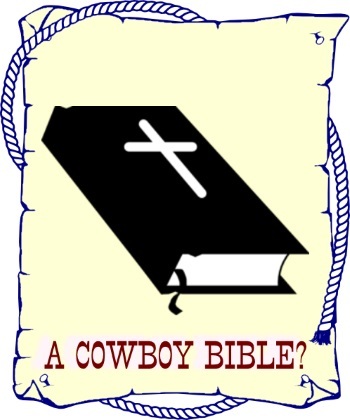 (A special NIV New Testament, "The Way for Cowboys", has the Bible text, plus some extras for people of a cowboy persuasion. I have one.) Less known is the Holman Christian Standard Bible, which is also considered accurate and readable. The New King James Version is reliable and readable as well. There are good Bibles available for people who don't want to struggle with the text, and can be used for evangelism as well as discipleship. There's no need to add to God's Word and dumb it down. In fact, this "Simplified Cowboy Version" could be considered blasphemous, but I won't hang my hat on that accusation just yet.